Private yet welcoming, The Royal invites members to write their own histories here. Our signature courses are ideally suited to casual or competitive play, encouraging for new and veteran golfers alike, our practice facilities foster easy social and professional interactions, and our well-appointed meeting and dining facilities are always accommodating. Are you exploring membership with a private golf club? Are you looking for a Club that will satisfy the diverse golf skills of your family while offering an active and satisfying social setting? The Royal Ottawa Golf Club offers this and much more, bringing an exceptional way of life to golf enthusiasts in the National Capital region for over 100 years. Only minutes from downtown Ottawa and Gatineau, the Club is rich in golf history, and enjoyed by many in a beautiful, modern setting. The traditional and challenging layout of our 18-hole main course will test the skills of even the most avid golfer, all in four hours! And, the relaxed atmosphere of the Royal Nine provides a perfect setting for those honing their technique, making it ideal for family foursomes and juniors. Our practice facilities are exceptional. Year-round, Members gather with friends new and old inside The Royal Ottawa’s historic Clubhouse, which serves as the focal point for both private and Member-organized parties and meetings. And whether it’s a family dinner in the Clubs Dining Room or casual lunch on the verandah after a round of golf, our Chef and his team will please even the most discerning palate. As a business person, The Royal Ottawa will provide you with an outstanding outdoor entertainment venue. Within the Clubhouse our facilities and dining rooms offer many high quality options for entertainment, for small or large groups. We have a facilitator that can take care of every detail on your behalf. The Royal Ottawa delights in introducing the history and grace of a private golf club to those who revel in the satisfaction of the perfect round or the charm of an evening spent with friends overlooking the 18th fairway. For your introduction please contact Peggy Henderson, Membership Director, (819) 777‑3866 x223 membership@rogc.com or complete the form. 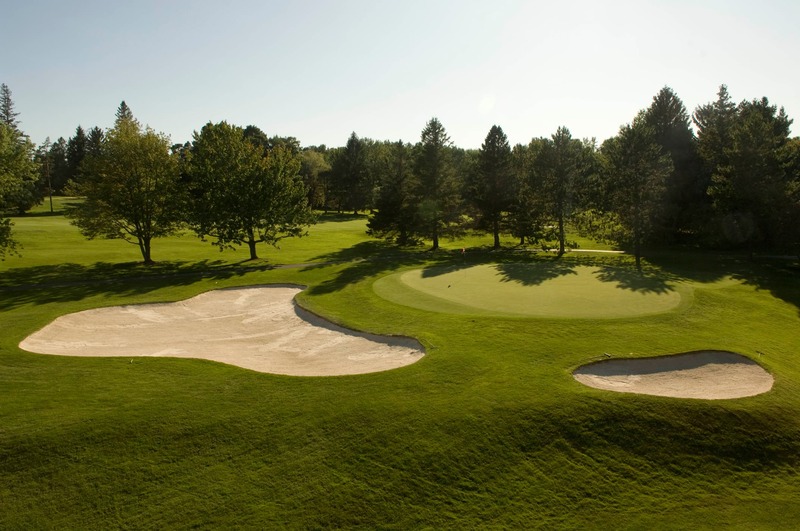 Ottawa’s premier Golf Club is just 10 minutes from downtown. Amid the tranquil beauty of the Tudor Style building overlooking the manicured gardens and lush greens it’s easy to forget that the Club is conveniently located only minutes from downtown Ottawa/Gatineau. At just 10 km from the Parliament Buildings, The Royal offers exceptional accessibility for a quick nine before work, a delicious lunch / business meeting or a leisurely eighteen on a warm summer evening. More location details can be found here. The Royal Ottawa, a championship course you will never tire of. The Royal Ottawa members are committed to continuing the tradition of maintaining a superbly conditioned golf course and unquestionably one of the premier golf courses in North America. Take a tour of our championship course here. The Royal Nine, an additional family-friendly yet challenging 9 hole course. Excellent for learning and confidence building. An outstanding family venue. A very good skills improvement environment for established golfers. An ever-expanding choice of premiere facilities throughout Canada and world-wide in 9 countries in Europe, Asia, Australasia, and Africa. You can view a list and visit their web sites here. Exceptional facility for both personal and business entertainment needs. An excellent venue for your next meeting, banquet or wedding. Learn more here. Exceptional casual and formal dining. Five wonderful dining facilities to choose from. Our beautiful clubhouse at The Royal Ottawa Golf Club can provide you with both fine dining and casual dining services, as well as private party catering, year round. The Royal prides itself on great service, excellent banquet facilities and delicious dinners to serve to your guests. Our golf clubhouse setting also provides you with a scenic backdrop of velvety green fairways. Our Junior program provides activities that serve the needs of three categories of junior golfers : new golfers, developing juniors, and competitive juniors. Learn more about our junior program here. Our “Royal 9” course serves well as a confidence building, junior golf environment. The Royal offers its members an unlimited number of member events including numerous in-house tournaments and a wide variety of social events throughout the year. The Royal Ottawa Golf Club is financially independent which is reflective of sound financial management of Club affairs. We continue to improve our facilities in a fiscally responsible manner. Learn more about some of our recent and planned improvements here. Outside Tournaments – We are proud to host only one major charity event annually. An important differentiator in the private golf club market. We do not rent our club out. Less tournaments = more golf for our members. Learn more about our involvement in our community here. Click on the image corners below to browse our Membership Package. Ordinary Membership, a perfect choice for golfers who want unlimited access to the course, 7 days a week. Associate Membership, offers an excellent opportunity for golfers with flexible schedules (see below for allowable times of play). Golfers over the age of 65 years will enjoy all of the privileges listed above with a reduced Entrance fee as well as an attractive payment plan, depending on their age at joining. Please contact the office for more details. You now have the opportunity to “give us a try” at three different membership categories, Ordinary, Associate and Royal Nine. This alternative offers new members the opportunity to see for themselves why our members believe this is the best private golf club in the region. We believe that once you experience The Royal Ottawa Golf Club, you will want to remain part of the Royal family. When you decide to join the Club on or before the end of the 60 day trial membership period, these fees will be credited to your Annual Fees. What better way to step into The Royal Ottawa while your family is enjoying their golfing membership. The Royal Nine member would have unrestricted access to the Royal Nine and Practice Facilities. They could play as a guest on the Main Course four times a year with green fees. Entrance fee for Royal Nine Membership are waived for the spouse of an Ordinary member. Annual Fees for Royal Nine Membership would include a complimentary Junior membership. Intermediate membership is the best value for young professionals, age 21 to 39 years. Enjoy playing on your schedule, as often as you want – with an outstanding payment plan, interest free, payable over as many as 14 years, depending on age at joining. An Intermediate who resigns in writing before their thirty‐ninth birthday will not be required to pay any unpaid portion of their entrance fees . When Intermediate members reach the age of thirty‐nine they will automatically become Ordinary members. Intermediate members hours of play: anytime. Social Membership is the perfect choice for those individuals who want full access to the Clubhouse for lunches, dinners and special events and are happy to play the Royal Nine course on Sundays after 3:00 p.m. with no green fees, or as a guest on either course four times a year with green fees. This membership is a great introduction to the Club and can be upgraded to a full membership in the future. Junior Membership (6 years to 20 years) will suit young golfers who are relatives of a member and want to learn the game at a prestigious course, with qualified professionals – or just enjoy a fun round of golf with family! As well, a total of 60 Junior members, ages ten years or over, who are not relatives of a member, may be admitted, provided they are proposed by an Ordinary or Associate member who assumes full responsibility for the non‐related Junior. Junior members’ hours of play: Please see Member’s Handbook or contact the Pro Shop for individual junior playing privileges depending on age and handicap. Special Members are members whose occupation or whose spouse’s occupation is, in the opinion of the Board, of such a nature as to indicate that their period of residence within 160 kilometers from the Club may be of a relatively short duration. Special members have the same Clubhouse and playing privileges as Ordinary or Associate members. Privileged Members (Ordinary, Associate and Social) pay only an Annual fee while serving in the following positions: Current ministers of the Crown, Leader of the Official Opposition and their spouses; Current Secretary to the Governor General and his/her spouse; Ambassadors, High Commissioners and other Heads of Missions accredited to the Government of Canada. Amid the tranquil beauty of the Tudor Style building overlooking the manicured gardens and lush greens it’s easy to forget that the club is conveniently located only minutes from Centertown Ottawa/Gatineau. At just 10 km from the Parliament Buildings, The Royal offers exceptional accessibility for a quick nine before work or a leisurely eighteen on a warm summer evening. As you can see the members of our club have much to be proud of: our fine facility, history, location and the camaraderie of our membership. The Royal Ottawa has a number of different membership categories. To join The Royal Ottawa Golf Club a nomination process is in place requiring involvement by existing club members. For further information about our categories and playing privileges click here.